The bottom-up fabrication of defined supramolecular nanostructures is key to the development of novel functional materials based on self-assembling systems. In this regard, liposomes are among the most studied self-assembled nanoobjects since their serendipitous discovery in 1964. They are defined as phospholipid vesicles consisting of one or more concentric lipid bilayers surrounding aqueous compartments. Liposomes are well recognized as pharmaceutical carriers because of their biocompatibility, biodegradability and low toxicity. They constitute one of the most successfully translated delivery systems that are currently in clinical use for a variety of indications against cancer, inflammatory and dermatological diseases, and in various types of vaccines. Despite their versatility and biocompatibility, the translation to the clinic of liposomal formulations could be hindered by the tendency of these lipid self-assemblies to aggregate and by their low degree of structural homogeneity, which are critical quality attributes with a major impact on the pharmacological properties. Liposomes correspond to metastable kinetically trapped states, which are formed by the input of external energy on a planar lamellar phase (e.g., sonication or mechanical filtration). The stability of these structures is kinetically limited because their lipid building blocks are highly insoluble, and therefore, the collapsed planar lamellar is the equilibrium state of aggregation. Additionally, liposomes suffer chemical and physical alterations, which shorten their shelf-life and limit, as a consequence, drug stability and conditions of storage. Due to these special conditions of preparation and storage together with the elevated price of phospholipids, there is a great interest in finding nonphospholipid building blocks or tectons, which self-assemble into stable vesicles and which satisfy the quality standards required in pharmaceutical formulations. The use of surfactants as cheaper and more stable substitutive molecules than phospholipids has emerged as a really interesting choice for the industrial production of vesicular systems in pharmaceutical and cosmetic applications. Besides, it has been proved that the use of cholesterol in many vesicle formulations helps to modulate the bilayer fluidity, to reduce the leakage, and to enhance the encapsulation efficiency (EE) of drugs. Therefore in the finding of stable non-liposomal vesicle-like assemblies, it is considerably interesting the formation of cholesterol-based supramolecular vesicles. Within this framework, Nanomol group discovered the formation of novel stable non-liposomal nanovesicles using aqueous mixtures of cholesterol and hexadecyltrimethylammonium bromide (CTAB), a cationic surfactant. This vesicle formation was achieved by a compressed fluid (CF)-based technology, the DELOS-SUSP method. It is noteworthy that none of the individual components of these novel nanovesicles self-assemble to form vesicular structures, since in water the insoluble sterol species form crystals and quaternary ammonium surfactants form micelles. In view of the high stability that these cholesterol-based supramolecular vesicles exhibited, this Thesis has been devoted to deep study the self-assembling phenomena and phase behavior related to these new nanostructures. We have reported on the ability of ionic surfactants and cholesterol to self-assemble forming stable amphiphilic building-blocks with the appropriate structural characteristics to form, in aqueous phases, closed bilayers, which we named quatsomes. We have investigated these novel non-liposomal nanovesicles at different levels, from their formation up to their applications. Furthermore, we have also studied the formation of other cholesterol-based supramolecular assemblies with non-vesicular morphology by the DELOS-SUSP process. 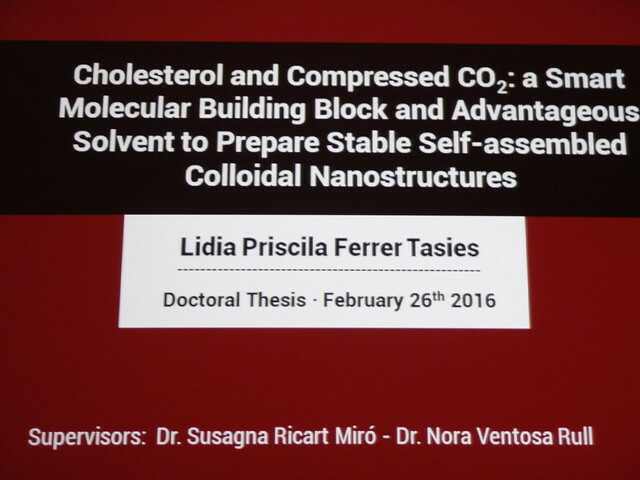 This Thesis therefore contributes to improve the knowledge about cholesterol-based supramolecular assemblies and demonstrates the enormous potential of CF-based methodologies for the production of stable self-assembled colloidal nanostructures with high content of cholesterol. JURY: Conxita Solans Marsa (Institute of Advanced Chemistry of Catalonia), Eduardo F. Marques (University of Porto, Portugal), Gonzalo Guirado López (Universitat Autònoma de Barcelona).